As a child time moved slowly like a dinosaur, heavy with anticipation and promise. The cosmic order hadn’t yet coalesced. I could still make time bend to my will, so that summers lasted longer as time stood still in this timeless ancient land we called Australia. Time itself is a curious concept, an agreed artificial measurement: 60 seconds in a minute; 60 minutes in an hour; 24 hours in a day; 365 days in a year; so many years in a life. Time is an absurd finite commodity. Some physicists claim that the past present and future coexist in the multiverse, while Einstein proved that time is relative, not absolute. That it was theoretically possible to travel at the speed of light, back and forth to points in time, all that’s needed is a device or conveyance that would transport you: A Time Machine! As a kid I remember being mesmerised by the 1960 movie The Time Machine in which actor Rod Taylor played an Edwardian H G Wells spinning forward in time to save humanity from a dire future. 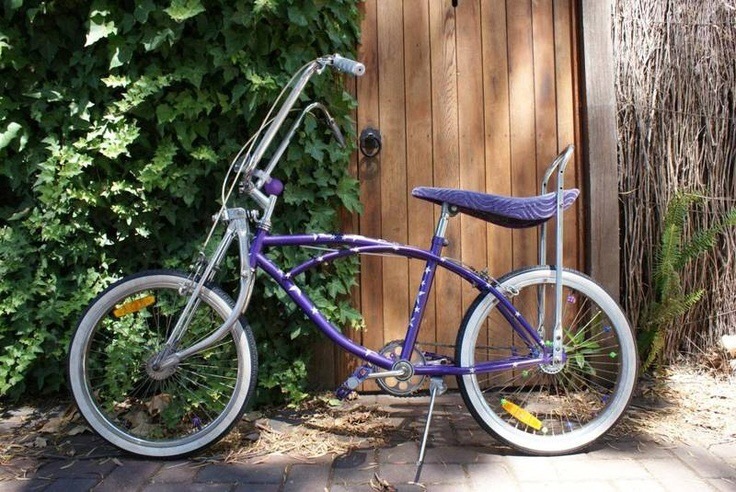 My time machine was a purple two wheel Dragster bicycle with white sidewalls, a light generating dynamo, sissy bar, banana seat, butterfly handlebars and three speed centre shifter. The complete bike gave off that curious effect of appearing to move even when stationary as if it was in two places all at once. Leaning forward, pushing my head between the bars and peddling hard, I could feel the edges of the future rub up against me as I caressed the contours of the road. Time oozed away, like Dali’s melting clocks. Time and tide wait for no man , says the old proverb , I can feel time speeding up. Nice. Enjoy the moment, and look forward to all those still to come! Hi Nick , nice piece and very nice bike. I think time is an illusion at best , I tend to agree with the physicists .